The Rigol 1102E oscilloscope is an exception when comparing the abundant features it provides for its economic price. This Rigol DSO model is one of the most selling product in its 100 MHz category and finds it vast application in research and development (R&D) wing, technical education, field engineering, electronics and electrical engineering laboratories, and many more. This was one of the first and still the best rigid oscilloscope to provide high scale digital signal processing. Some of its distinct features include a high memory depth of 100 MHz. complex mathematical calculations using FFTâ€™s, the record and replay features, roll mode, alternate triggering capabilities and adjustable trigger sensitivity. All these features and many more comes with this powerful Rigol scope at a budgeted price. The front panel of the Rigol scope has easy to access buttons. An AUTO button is provided to quickly adjust and measure the waveform displayed. The viewing features of the waveform displayed can be enhanced using the deviceâ€™s high real sampling rate of 1 GS/s and equivalent sampling rate of 25 GS/s, along with the brilliant triggering and analyzing functions. There are 22 types of auto measurement of wave parameters and track values that is in-built in this device. The automatic measurement of voltage includes channel datas like voltage (max. ), voltage (min. ), arithmetic mean, peak-to-peak voltage, peak voltage, true RMS voltage, overshoot and pre-shoot. Time measurements can be done using frequency period, rise time, fall time, positive width, negative width, duty cycle and more. The Rigol 1102E model is equipped with a USB device interface which helps to transfer data as a device and host when connected to a desktop PC. Basic upgradation on board firmware can also be done.The PC application software called UltraScope is very powerful, and can be used to capture and save waveforms, and measure it accordingly. The waveforms can be saved in â€˜.bmpâ€™ format and the files can be saved in â€˜.txtâ€™ or â€˜.xlsâ€™ format. The Rigol oscilloscope can also be connected to a PictBridge compliant printer to print waveform images with ju7st a click. A network interface feature can also be called to operate the oscilloscope remotely by sending appropriate commands over the network. Like other digital oscilloscopes, this Rigol scope can also be used to capture complex signals in great detail over extended time periods. This helps the user to get a good look at the high frequency effects within the captured waveform. The long memory feature can be enabled on the device by accessing the â€œAcquireâ€ button, for which a dropout menu will appear on the right side of the screen. Find the blue soft button corresponding with Long Memory, and turn the memory depth Long Memory. We have prepared another article where some of the best digital oscilloscopes have been listed. Please go through and compare the features. Almost all the reviews in Amazon.com suggests that the DS1102E model is the best Rigol oscilloscope available in the market today. 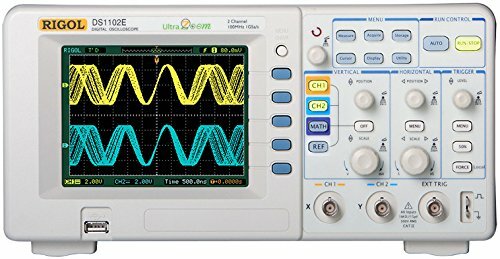 One of the reviews says that there is pretty much nothing negative to comment about this oscilloscope. Unlike other similar products, this model has everything working perfectly and there is nothing detracting to say. I have had this scope for about a year now. For the price, I am blown away. I am an electrical hobbyist and engineer, I work with much higher end scopes at work from Tektronix and this one performs just as well as any of the lower frequency scopes I have worked with. There are a few complaints, but none of them warrant removing a star. Works up to the specified bandwidth without issues (built some high frequency oscillators to test this). Has some very good digital filtering that can be set to get just the signal that you want. Well built and rugged in nature. Another user reviewed about the fan noise being quite soft. Even in a silent room, the noise was unheard. Another reviewed about the low resolution display. But, when comparing the low price of the device, along with numerous useful applications, the display is nothing to bother after immense use. Old-fashioned control buttons which can sometimes be hard to use. When naming an image to store on the thumb drive, if the image title IE ColpittsTEST-1, is a custom one other than the default, the auto-numbering scheme does not recognize it.